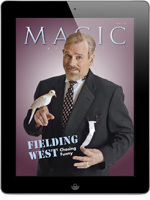 The March 2012 issue of MAGIC Magazineis now out, available both in print and on the iPad. If you haven't already received your copy, here's an advance look at what's "between the covers." 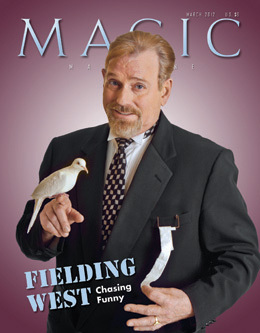 Our cover story this month is Fielding West, whose mother showed him a card trick when he was seven or eight. She had learned from her father, who a few years later promised to take young Fielding to "the place where magicians keep all their secrets." He even went so far as to blindfold the boy. After being guided sightless for three or four blocks down the street and into a cool building, Fielding removed the blindfold to discover he was in a library. "The secrets are kept here," explained Grandpa, "and they are safe here because no one reads." That day, Fielding became a reader. One of the things that I learned from my experience on the ill-fated Magic Cruise aboard the Carnival Splendor a year ago is that news stories are not to be trusted. Reports of what happened on the strickenSplendor were grossly skewed, turning minor events into full-blown disasters. After reading one such story about our "ordeal," I remember thinking, "Sure glad I wasn't on that cruise!" So when I heard there was a magician on board the Costa Concordia — which, by the way, is one of the sister ships to the Splendor — and that the accident occurred during one of his shows, I thought it was best to ignore the reports flying around the Internet and, instead, to contact the man directly. The result is his exclusive story in this month's MAGIC. I hope you enjoy this issue. And if you do, please tell a friend. P.S. Calling All Conventions! The MAGIC Magazine Convention Gridwill appear in the April 2012 issue, both in print and digitally. If you are a convention planner, don't miss out on having your event listed in this exclusive "catalog of conventions." Simply go to our website,www.MAGICmagazine.com, select "Online Convention Guide," and follow the instructions for Convention Producers. Remember, there is no charge to be listed, so sign up today. "I will produce for this audience a 600-pound man-eating Bengal tiger!" The man onstage covers himself with a cloth. Suddenly, a horrible growling attack is heard. When the cloth is dropped to the floor, the man is again revealed. No tiger is in sight, but the man's clothing has been ripped to shreds. "That's as close as I'm gonna get," shrugs the tattered Fielding West. But while the giant feline never materializes, plenty of laughs do. They truly are a "league of extraordinary gentlemen." While not claiming that name, or the characters from the comic books or film of that title, the seven star performers of The Illusionists are indeed extraordinary. All seemingly endowed with magical abilities, these performers have pooled their talents and created a powerful new show. On January 13, the Costa Concordia cruise ship hit a reef off the Tuscan island of Giglio, and 4,000 passengers and crew were forced to abandon ship in lifeboats or jump into the frigid water and swim about two hundred yards to shore. Three weeks later, there are seventeen confirmed deaths and fifteen people are still missing. Captain Francesco Schettino has been placed under house arrest and is being investigated for manslaughter and abandoning ship before all the passengers and crew were safely evacuated. At the time the ship hit the rocks, Italian magician Mago Martin was performing his second show of the evening. Here is Martin's exclusive report of what happened that fateful night. "I guess the character I'm trying to portray onstage is 'the coolest person in the room.' He's smooth; a James Bond-like character." Mike Douglas describes his onstage persona with those very words in a casual, unassuming way. It's a persona — along with an act and, indeed, a life — that has experienced its share of difficulties and maturity. When talking, his cadence is irregular, but soothing. He laughs a lot and is forthcoming with his answers, even when talking about difficult topics. So what does it take for a little African-American kid growing up in North Carolina to become the coolest person in the room? Wrapping up our three-part series on modern trends in marketing and promotion, we turn to social bookmarking, and other ways to let people know who you are and where your interests lie. 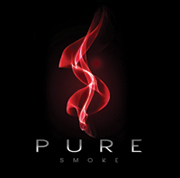 Illusion Fusion, which premiered on January 12 at the Golden Cabaret of the Horizon Casino in Lake Tahoe is the newest magic show produced and directed by Tony Clark. The star of the show is Alex Ramon, who Tony believes is "the next up-and-coming guy in magic." Garnering enthusiastic, four-star reviews in the Chicago press, Death and Harry Houdini returned to The House Theatre January 21. Befitting the title, the show portrays the illusionist as a man bent on defeating his own mortality. 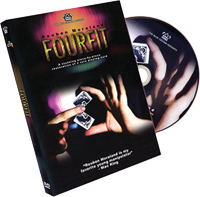 This is the third incarnation of the show, which was originally staged in 2001. The Magic Castle is sporting something of a new look these days, having reopened after repairs necessitated by the fire that occurred on the roof of the Hollywood landmark last Halloween. The traditional Founders Day celebration — commemorating the January 2, 1963 opening of the club — was moved back to January 13 this year, the day of the official reopening. A report on the seventh annual Session Convention in the UK, news of the three new magic shows opening in February in Las Vegas, and sad farewells to Francis Martineau and Tony Giorgio. Chris Randall shares the strangest use for a double-backed card ever to see print, while we explore a technologically advanced way to perform one of the best-selling marketed effects of the last two decades. The rest of the issue contains four smart, useable card ideas, rounding out another informative installment of "Talk About Tricks." In the previous two months, we touched on entrances and act structure. This article pertains to performers who speak, and we'll examine several different aspects of scripting your lines. Too often we hear the same old patter, familiar jokes repeated in numerous performers' acts. It is tiresome and says little for your creativity and effort to bring the audience something that is unique to you. For pure impossibility, it's my estimation that object-to-impossible-location is one of the most astonishing effects one can perform — and it's even better if you can use the magnetism of money. 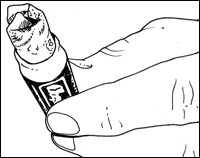 The classics are Bill to Lemon, Bill to Cigar, Bill to Wallet, and now introducing: Bill to ChapStick! OMG. Timothy Leary was right. It's time to "drop out." I started dropping out right around My Space, dabbled briefly with Facebook, and Tweeted maybe twice. I'm still Linked-In, if I can remember my password — but basically, I'm done with social media. How is that supposed to work for everyone, especially those of us who really, really want to be at the center of attention? I mean, don't we need to be at the center of attention, at least long enough to make a living? These amateur egocentrics are ruining it for us professional egocentrics. Francisco has a spectator choose a card, look at it, and keep it temporarily hidden from view. He then invites the spectator to draw any kind of random squiggle. Francisco takes the pen and highlights certain areas of the spectator's squiggly line — two curves that form a shape like a numeral three, then a diamond shape. Having shown everyone that these shapes really are contained in the line the spectator drew, he deduces that she was subliminally conveying three and diamond. Sure enough, the spectator's card is the Three of Diamonds!